I have been sick and I have been busy. The weasels in my lungs attempted to take up permanent residence, thwarted only by a solid week’s worth of insomniac coughing fits. I also spent a solid week planning, shopping for, and cooking enough food to feed five hundred people a day. I’m still compiling my notes and photos from that project, but I realized I had one post left from the holidays. Xmas Eve dinner is held at Mom’s house, and the meal had been cooked by Mom for decades. I began helping in the kitchen about ten years ago, assisted with the menu planning around the same time, and finally took over cooking the meal five years ago. Some elements of the menu never changed: the appetizer was always shrimp cocktail, the main course was either a beef or pork roast, and there were two or three vegetable sides. I started slipping in more refined elements – bernaise sauce with the beef filet, risotto instead of mashed potatoes – which were met with the family’s approval. So when it came time to plan the most recent menu, I decided to go for broke and suggest that we abandon the shrimp cocktail in favor of something new. 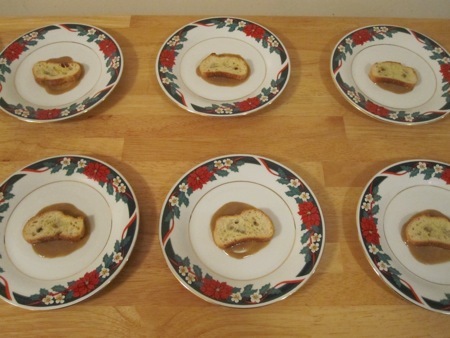 I planned on making the “Caesar Salad” (Parmigiano-Reggiano Custards with Romaine Lettuce, Anchovy Dressing, and Parmesan Crisps) from The French Laundry Cookbook, a dish I had made many times before, usualy for one of She Who Must Be Obeyed’s annual birthday dinners. I realized that I could prepare almost all of the dish in advance in my own kitchen, then transport the components to New York where they could be assembled at dinnertime. 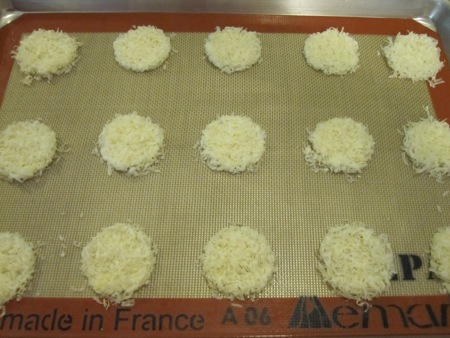 I started with the Parmesan crisps: I grated a half cup of Parmigiano-Reggiano (from a moist piece of cheese, very important) and spread two teaspoons of the cheese into a two-inch ring mold to shape it on top of a silicone baking mat. After ten minutes in a 325°F oven, the cheese browned and melted. 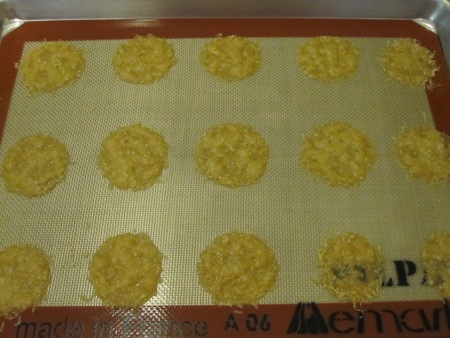 I lifted them off the mat and let them cool completely before storing them between pieces of wax paper. 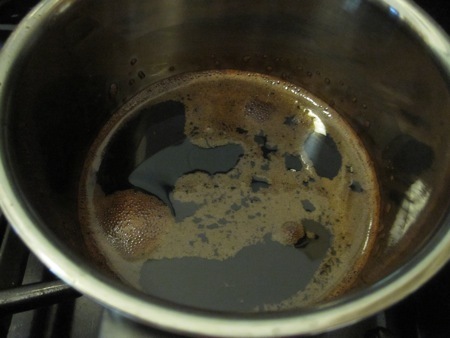 While the crisps baked, I began reducing two cups of balsamic vinegar over very low heat, never allowing it to come to a simmer. 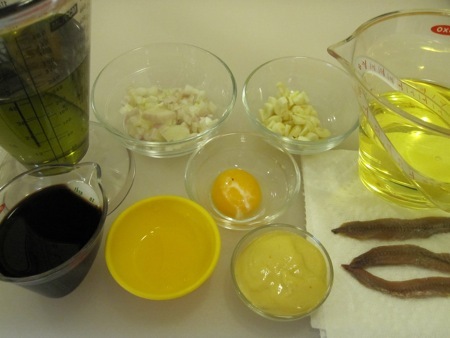 Next I assembled the ingredients for the anchovy dressing: one and a half tablespoons each of chopped garlic and shallots, a quarter cup of balsamic vinegar, two tablespoons of Dijon mustard, a teaspoon of lemon juice, two anchovy filets, a large egg yolk, a cup of extra virgin olive oil, and a cup of canola oil. 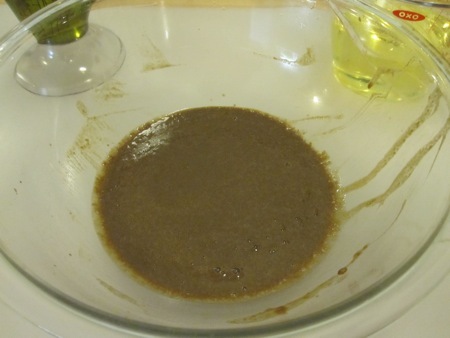 I pureéd the garlic, shallots, vinegar, mustard, lemon juice, and anchovies in a blender until smooth, then transferred the mixture to a bowl and beat in the egg yolk. 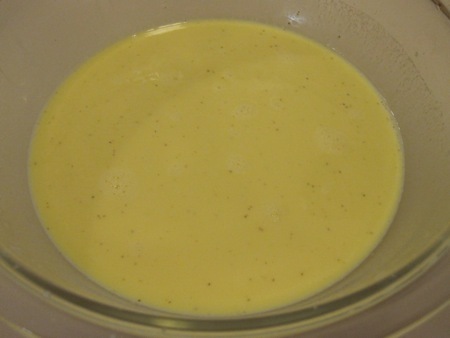 I slowly whisked in the oils, finished the dressing with white pepper, and stored it in the fridge. 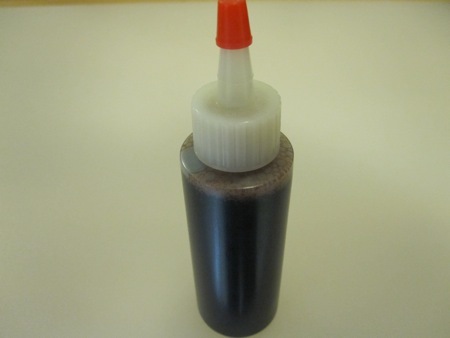 By this time the vinegar had reduced, leaving me with a quarter cup of thick glaze which I decanted into a squeeze bottle. 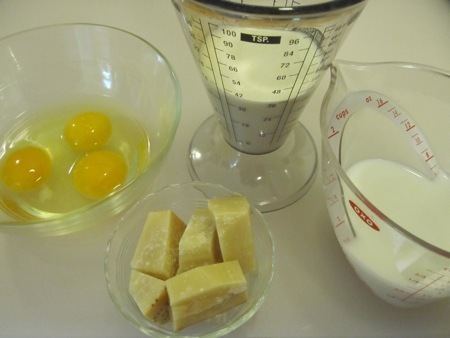 To prepare the custards, I assembled two thirds of a cup each of milk and heavy cream, three and a half ounces of Parmigiano-Reggiano cut into chunks (mine came from the cheese rind stash in the Deep Storage Facility), and two large eggs plus one yolk. I put the milk, cream, and cheese in a saucepan, brought it to a simmer, turned off the heat, covered the pan, and let the mixture infuse for forty five minutes. I whisked the eggs together, then slowly whisked in the hot strained milk and cream to temper the yolks. 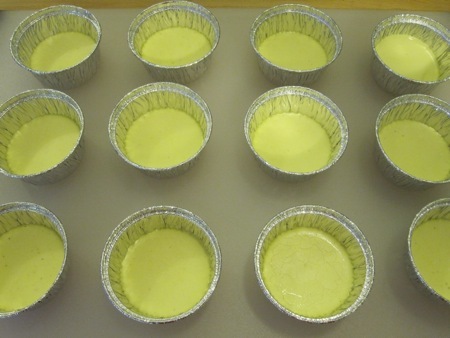 I ladled two tablespoons of the custard mixture into each of twelve foil baking molds arranged in a roasting pan. I added enough hot water to come halfway up the cups, weighing them down with a baking sheet to keep them from floating. I covered the roasting pan with foil and baked the custards for thirty minutes at 250°F. I removed the custards when the edges were set but the centers were still soft. I refrigerated the custards and completed the final component – the croutons – by baking half-inch thick baguette slices in a 300°F oven for about fifteen minutes. 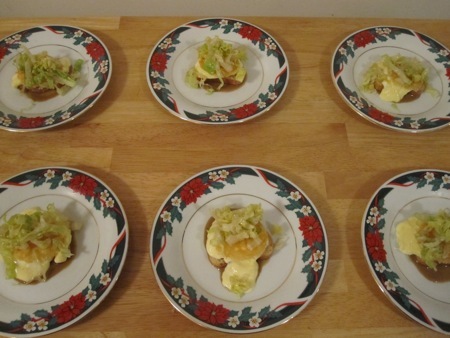 It was time to unmold the custards and set them on top of the croutons, the most difficult part of the plating, but something I had done successfully before. 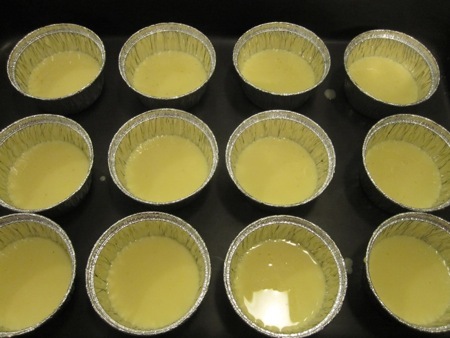 Not this time: the custards didn’t hold their shape at all, choosing instead to ooze out of the molds. I had no choice but to use them as is, more of a thick parmesan cream than a solid custard. 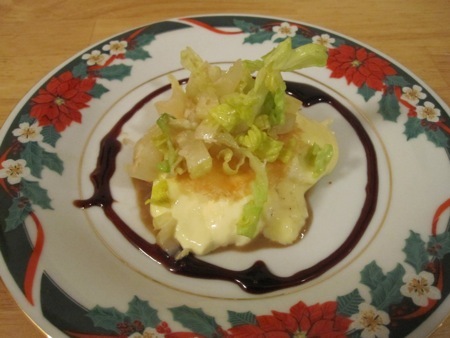 I topped the custard with a parmesan crisp, and then a chiffonade of romaine lettuce tossed in the anchovy dressing. Lastly, I finished the plates with a ring of the balsamic glaze. The dish is a deconstruction of a culinary classic that retains all of the flavors and textures of the original: it’s creamy, crunchy, salty, slightly sweet, with notes of egg and cheese. It may have looked like hell, but it tasted the way it was supposed to. What happened to the custards? 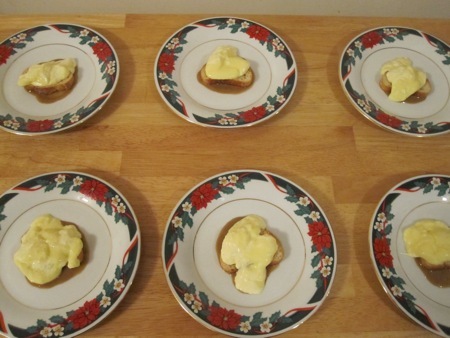 I can think of several possibilities: The custards were about two days old by the time they were plated, so they might have begun to weep a bit. Although they were carefully packed to avoid damage, the vibrations from the three-hour car ride may have sheared the custards in the cups. And, lastly, it’s possible Mom’s fridge wasn’t cold enough and the custards simply softened. 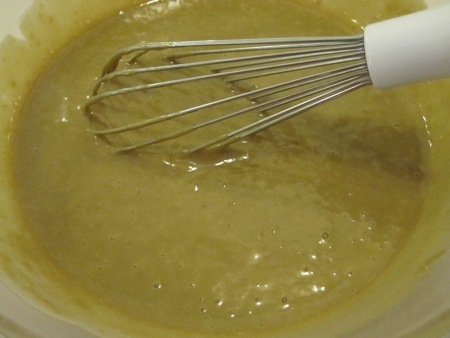 Regardless of the cause, I know that adding a bit of xanthan gum will keep the custards set. They won’t technically be custards anymore – adding a gel will make them panna cottas – but I won’t have to deal with plating disasters.